1) Suitable for sound receiving from electronic products with audio output,i.e.TV,computer,DVD,VCD. 2) You can enjoy your favorite TV show freely without disturbing anyone else by using wirelessearphone. with the frequency ranged from 88-108MHZ. 4) Imported chip and core lechnology.ultra strong signal recciving and outstanding effect. Acceptance distance (no greater than) 30m,even behind walls. 5) Receive all-channel sound accompany from TV.computer.DVD(VCD).and-scanning and FM stereo receiving. 6) Unique.neoteric and fashionable appearance with patent rights. If you want to make custom Wireless Headphone with Microphone with your logo,slogan,telephone,website,email , please send us your design or give us instructions about your imprint.We'll send a free virtual art proof for your approval,you can ask a real sample with logo before production too. 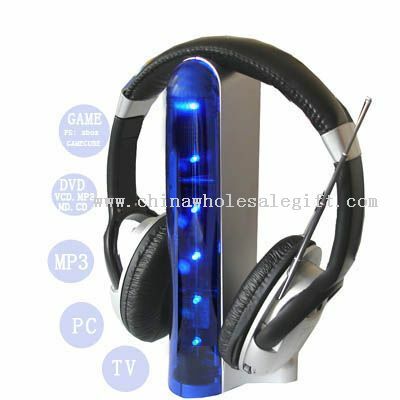 Our Wireless Headphone with Microphone is popular as promotional,advertising, business,corporate gifts.